For the first time, high school students from Lothian (Edinburgh) competed against each other on questions relating to the functionality of the brain. 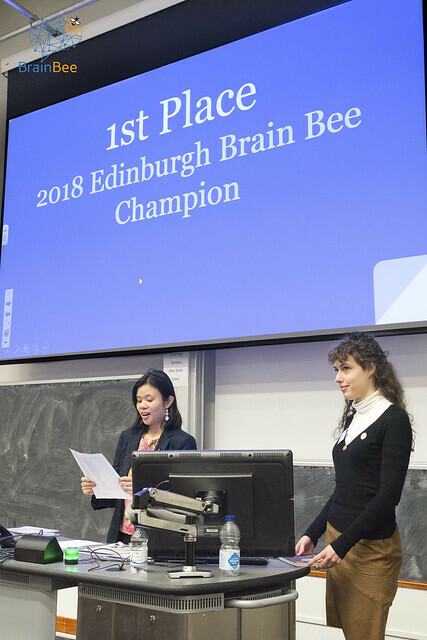 The regional Brain Bee Competition, which took place on the 24 th of February (Saturday) at the University of Edinburgh, encourages participants to explore the diversity and depth of the mechanisms of the brain far beyond standard high school level and to gain experience beyond their classroom. The competition also provides opportunity to be introduced to the vibrant research community and variety of centres that make up the Edinburgh Neuroscience and are well-known for their integrated, cross-disciplinary and quality research. followed by the International Brain Bee Competition in July 2018, Berlin (Germany).